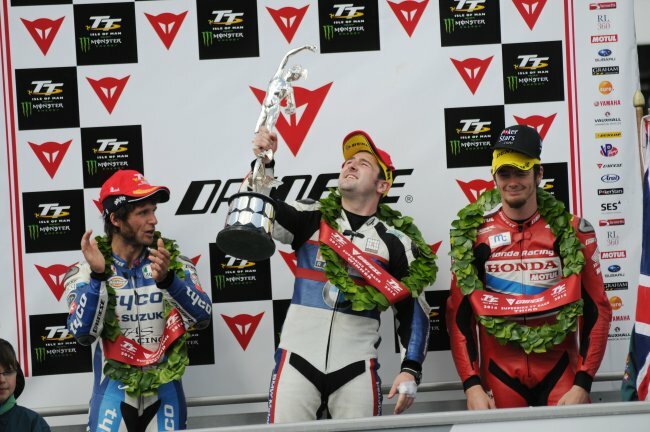 Michael Dunlop took his eighth TT victory when he won Saturday’s 6-lap Dainese Superbike race in record-breaking style. The BMW Motorrad rider took control from early race leader James Hillier at Ballaugh on the opening lap and, aided by two laps inside the old outright lap record, he surged clear and was able to control the race in the closing stages to take the win by 20.5s from Guy Martin (Tyco Suzuki) with Conor Cummins (Honda Racing) in third. There was also sensational news on the final lap when Bruce Anstey, outside the top ten on the opening lap after overshooting the Nook, tore round the Mountain Course on the Valvoline Racing/Padgetts Honda to become the first man ever to have lapped at more than 132mph with a final lap of 132.298mph. Hillier was quickest to Glen Helen on the opening lap on his Quattro Plant/Muc-Off Kawasaki and he led Dunlop by one second with Martin, a rapid starting Dean Harrison (RC Express Racing Kawasaki), Gary Johnson (Lincs Lifting Honda) and Dan Kneen (Cookstown BE Racing Suzuki) close behind. As the lap unfolded though, it was clear Dunlop was charging and having overhauled Hillier at Ballaugh, he increased his lead all round the opening 37 and ¾ miles and with a new lap record of 131.730mph, he rocketed clear with Martin 9.4s in arrears. The leaderboard was constantly changing and Cummins moved up into third with Hillier, Harrison and John McGuinness completing the top six with Johnson reported retired at Creg ny Baa. Dunlop was in determined mood and was closing in on Martin, who had started twenty seconds ahead of him on the road, the gap between the duo after two laps almost 17 seconds as the Ballymoney man went quicker still at 131.890mph. The Tyco Suzuki rider was six seconds clear of Cummins as they took their first pit stop with Michael Rutter up to fourth on the Bathams BMW. Dunlop, Martin, McGuinness and Hillier were circulating in close formation on the roads but Dunlop’s lead was increasing and he was first into the pits at the end of lap four, the gap to Martin now a very healthy looking 25s after another 130mph+ lap. Martin was coming under pressure from Cummins though with his advantage now under five seconds for the first time while Rutter was still in fourth with McGuinness and William Dunlop completing the top six. As the race went into it’s final third, Dunlop and Martin were still together on the roads and the 25-year rode to his signals to control the race for his eighth victory and BMW’s first ‘big bike’ win since German Georg Meier won the 1939 Senior. Martin took his 14th podium in second with Cummins three seconds further back after doing his all on the final lap. Anstey really put the hammer down after his early race mishap and his lap of 132.298mph was some six seconds quicker than McGuinness’ lap set in the same race last year. Rutter ensured it was a good day for BMW with a strong fifth with William Dunlop making a late charge to overhaul McGuinness on the final lap, the gap between the pair just 0.8s after six hard laps. The 20-times winner had to settle for seventh with his wrist injury, as expected, unable to run the pace for six entire laps but it was a solid effort by the Morecambe man. Harrison and Hillier both dropped back as the race wore on, finishing in eighth and ninth with Josh Brookes completing the top ten. Newcomer Peter Hickman had a brilliant ride into 14th place with his final lap of 126.195mph making him the second fastest newcomer in TT history and it also meant he was the first privateer home with Ivan Lintin (17th) and Russ Mountford (18th) second and third in the early TT Privateer’s Championship. Debutantes Martin Jessopp and Danny Webb both picked up bronze replicas in 26th and 37th also posting their best laps of the event so far at 123.470 and 120.508 respectively.